KABUL, Afghanistan (AP) - Thousands of spectators pleaded Friday to spare the life of a convicted killer but then watched the brother of one of his victims cut his throat in the first public execution in the Afghan capital since November. Hundreds of women in all-enveloping burqas were among an estimated 4,000 people who filled the seats of the Kabul sports stadium, witnesses said. Mohammed Daoud had been convicted of killing two men, identified only as Samiullah and his cousin Nasimullah, in an eastern neighborhood of Kabul. It wasn't clear when the killing had taken place. 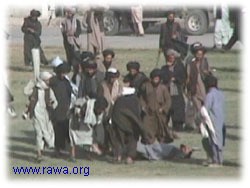 The execution was carried out by Maulvi Mohasil, the brother of Samiullah. 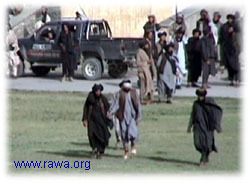 Mohasil refused pleas from the spectators, as well as from the ruling Taliban militia's military court chief justice, Haibatullah Akhund, to forgive Daoud. 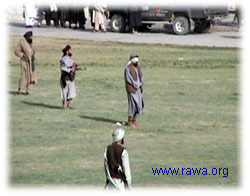 Under the Taliban's strict interpretation of Islamic law, the victim's family can execute the convicted killer. But the law also allows the family to forgive. "I will never forgive him," Mohasil said. "He broke the heart of one big family." 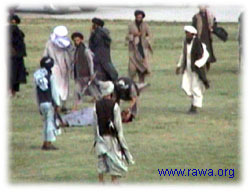 In the 90 percent of Afghanistan that the Taliban control, convicted murderers and adulterers are killed, the limbs of thieves are amputated and people found guilty of lesser crimes are beaten. 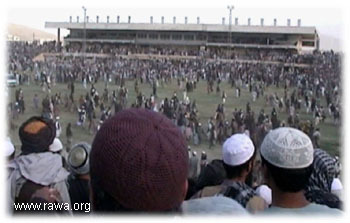 There were almost weekly executions or amputations of criminals in the Kabul stadium before November 1999, when a woman was killed for hacking to death her abusive husband. 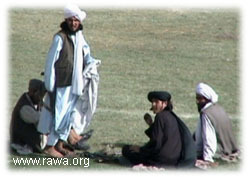 Akhund attributed the hiatus in public executions since then to a decline in crime in the capital. It wasn't clear whether Friday's execution marked a resumption of regular public punishments. 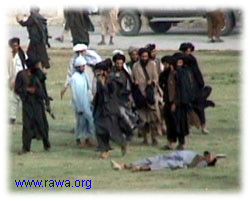 The day's spectacle began when Taliban soldiers led Daoud, whose eyes were covered with a white scarf, into the stadium. Daoud prayed for 10 minutes. When he finished, Taliban soldiers tied his hands behind his back with another scarf. Mohasil, the brother, entered the stadium with Samiullah's wife and three children, along with Nasimullah's mother. Slowly Mohasil walked toward Daoud. He came up behind him and with a knife cut his throat. "Now we have our revenge," Mohasil said. "I will sleep tonight. I have done a good thing."